New year and new challenges. It is time to get organized and get all the important dates written down. 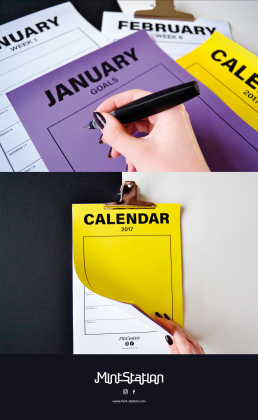 If you are as old school as I am and prefer a paper agenda rather than a digital one, this is something for you: a printable year Calendar for 2017. It contains 68 pages, it has a weekly planner and pages for monthly goals. You can download it for free till 15.1.2017 | ENDED. I hope it will make your time management easier.